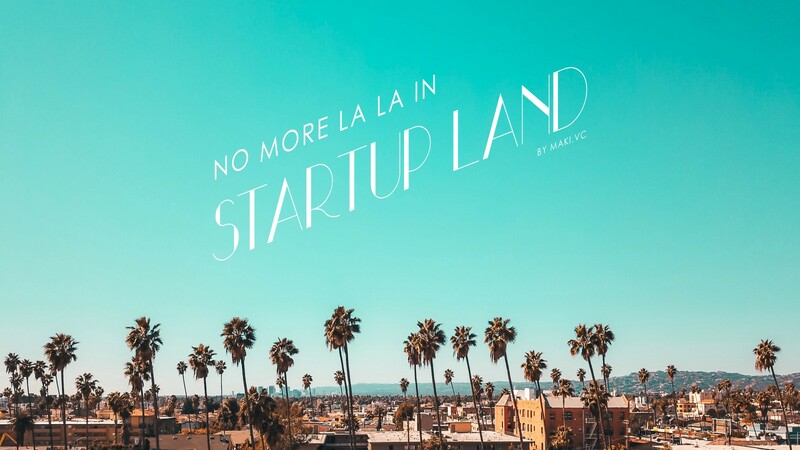 No more La La in Startup Land? Over the past ten years, the number of startups and venture capital has surged to unprecedented heights. Now that the next downturn is looming, what’s awaiting the tech ecosystem? For the past five years, European startups have had a party. In 2018, the total capital invested in technology within the area climbed to $23bn from just $5bn in 2013. Last year, Spotify became Europe’s largest ever VC-backed tech company to go public, its valuation reaching almost $30bn on the opening day. While European employment grew 1.1 % in 2018, the tech workforce increased four times that. Especially here in Finland, there’s never been a better time to be an entrepreneur. The shift in mindset has been so significant that it’s almost erased the bleak early-2010s’ post-Nokia era from our collective memories. The Finnish startup scene is now known for its unrelentless ambition and a can-do attitude, a great example being the original Slush team: turning a nerdy underground event into a 15,000-visitor laser-lit embodiment of the new era of entrepreneurship. However, lately the gods of macroeconomics have been in our favour. Since the collapse of 2008, Europe has rebounded: GDP of the area has grown slowly but steadily, unemployment is at its lowest since 2009, and in 2017 the International Monetary Fund went as far as nominating Europe as the engine of global trade. Yet as we’re reaching a ten-year streak in the post-recession bull market, the possibility of a downturn has started to emerge in hushed coffee table conversations. What will happen to the rockstar entrepreneurs and the supporting ecosystem once the tide turns? The best way to predict the future is to learn from the past, so we crunched some numbers to see the differences and similarities between today and the two worst economic crises of the past: the 2000 dotcom bubble, and the 2008 subprime crisis. There are a lot of graphs, so we suggest you pour yourself a hot drink and get comfortable. 2000 was a bad year for tech. In 1995–2000, the Internet had grown from a baby into a teenager, resulting in every company and consumer wanting to get online. A long and complicated story short, the exuberance of the Internet companies and their investors became irrational and resulted in NASDAQ’s crash in March 2000, and the crisis continued to worsen in the aftermath of 9/11. As markets both in the US and Europe fell into hysteria, tech valuations and round sizes were slashed across all company stages. Deals that were made in the aftermath came with significantly worse terms for the entrepreneurs: the investors’ median share acquired in early later-stage US rounds nearly doubled in 2001–2003 before gradually returning to the levels of the historical equilibrium. Looking at 2018, it’s evident we’re much closer to the setting of 2001 than 2008. Later-stage valuations have grown astronomically and the round sizes of early and late-stage investments are reaching levels of the pre-dotcom bubble. The trend in later-stage is driven by the $100m+ mega-rounds into companies such as Uber, WeWork and Airbnb, whose owners, encouraged by frothy market conditions, have kept pushing the IPO goalpost forward and contributed to moving the average time for going public from 6–8 to 10–12 years. In Europe, the top three mega-rounds in 2018 went to Auto1 (€460m), About You ($300m) and BioNTech ($270m), all based in Germany. Thanks to the benchmark effect, the perceived potential in the market has gradually led to a significant increase in valuations across all later-stage companies, and not everyone is happy about it. Researches at UBC and Stanford recently estimated that half of current US unicorn valuations are overstated by 50% above fair value. According to the same study, 15 of those unicorns would be valued more than a double their fair value. Yet it’s not just the lucrative macroeconomy that has encouraged the VCs to take longer positions. Later-stage valuations are inflated when the price of a Series C/D round is applied retroactively to all prior series, ignoring the fact that a straight-forward Series A equity share isn’t the same as a later-stage share with complex differential voting rights, price protection, ratchet provisions, drag-along and tag-along rights, pre-emptive rights, anti-dilution provisions — the list goes on (Anthony Mirhaydari has written on this phenomenon here). This isn’t usually a problem when the plan for an exit is solid, but when a difficult, lower-value exit is on the horizon the gap between individual share class value grows wider. Once the capital structure is simplified and the valuation deflates back toward fair value in conjunction with an IPO, the post-exit performance is unable to meet expectations. When the economy dips there will be a high number of down rounds, and the ones taking the first hit will be the startup employees with late share class options and high strike prices. The current situation is unsustainable as the investors’ and entrepreneurs’ objectives have detrimentally fallen out of sync. The next downturn will serve as an opportunity to simplify the later-stage rights and to recalibrate the perceived difference in risk between early and late-stage investors. Recently the startup blogosphere has been active in discussing if and why seed deal volume has been on the decline for the past couple years. There are two countering hypotheses going around: the volume of seed-stage companies has increased more rapidly than the number of “portfolio slots” in early-stage funds (Mark Suster’s blog here), or there is only a reporting delay due to the flexible nature of the VC industry and that the volume is actually increasing (Yoram Wijngaarde’s blog here). Our view lands somewhere in the middle. Based on discussions with other early-stage investors across the Nordics, the number of good seed ideas in VC dealflows has somewhat stagnated. In addition, the best deals have become more elusive as the number of investors focusing on the beginning of the funnel has increased. Yet, bad economy or not, we believe that good ideas and good teams will continue to be funded. For an investor, seed is a great investment during a recession: the ticket sizes are small, the valuations are low, and the team is feeling fresh, motivated and engaged. For the seed-stage entrepreneur, a downturn is a perfect test bed for the product-market-fit, R&D talent is easy to find and there’s less competition. Judging by the data on deal counts from the previous recessions, we predict that the early-stage will take the biggest hit in deal volume and the second biggest in deal price, just after later-stage. Early-stage falls in between cheap seed and later stage with too much sunk costs to let sink — the bets will become even more polarized than they currently are. In the US, there is as much dry powder available as both before the burst of the dotcom and subprime bubbles (the spike in 2001 in dry powder is likely due to a reporting delay). In Europe, undeployed capital is at a historical high, thanks to the rise of mega-funds in the range of €500m-€1bn+. Cross-border investments have been on a steady rise since the early 2010s both in Europe and the US. For entrepreneurs dreading for the next recession, this should, at least in theory, be good news: investors are sitting on a lot of money, and that money must be put into use — downturn or not. Yet, as each recession accelerates, the Darwinian process and the number of potential companies to invest in drops, the record-high capital available will most likely struggle to find a place to land. There are some alleviating factors to consider — capital flows more effortlessly across country borders and Europe has proven its ability to produce successful companies beyond a limited local perspective — but the staggering pace at which the industry has grown both in terms of deal count and volume, these factors won’t be able to mask the problems of the over-sized industry. Everything goes in cycles, and VC is not an exception. Before the dotcom era, the majority of limited partners investing in venture capital were university endowments, foundations and wealthy families, but in the late 1990s big pension funds wanted in, exploding the capital invested in funds. In 2009, in the aftermath of the subprime crisis, the situation was similar — the overflow of capital led to poor capital efficiency in portfolio companies, decline in investment quality, and ultimately to low fund returns. At both times, industry veterans blamed the newer funds for investing based on the excess of dry powder and its expiration date, instead of the actual need of the target companies. Economists pleaded for the industry to self-regulate and downsize. Despite the pleas, the industry has continued to grow and is now five-fold in size in comparison to 2008. During the next downturn, VCs across the world are likely to be having the same discussions they had in 2001 and 2009: the industry needs to downsize. In 2002, both Accel Partners and Kleiner Perkins led by example and downsized their then-mega-sized war chests by 20–25 %, but they were rather exceptions than the rule. Both fund downsizing and the change of investment mandate are difficult, yet possible to do, and it remains to be seen if these will become more commonplace in this recession — both largely depend on the demands, level of involvement and the potential defaulting of the fund’s LPs. The value of M&A activity both in the US and Europe has been peaking over the past years, and paradoxically, the growth has in the past indicated that the things will soon take an ugly turn. Historically, the frenzy of mergers has coincided with a period of credit expansion or a stock market boom. As the intensity of the cycle increases, the rationale behind the mergers becomes less rational — not too different from the reasoning behind soaring valuations of later-stage companies. In a recession, unsurprisingly, both the value and the volume of M&As will suffer. When times are bad, corporate CFOs take a stronger role and emphasise frugality and effectiveness at the cost of growth and acquisitions, closing the market for trade sales. For some investors and entrepreneurs doing a fire sale in a bad economy might make sense, but it’s the buyer’s market and the financial benefit for the seller is extremely limited. The US IPO market is a precise derivative of broader market conditions, and US tech giants are now racing towards an exit before the next downturn hits. In Europe, the volatility in public listings is much higher due to investors’ more cautious approach to potential and pricing, and it’s clear that they are already getting nervous — partly due to the length of the bull market, partly due to the uncertainties surrounding Brexit. Even though there are a lot of promising companies in the pipeline, the price sensitivity has significantly increased due to poor post-IPO performances such as Bawag and Rovio. The number of European companies pulling from the IPO process is at its highest since 2015, and it’s likely the number won’t be dropping anytime soon. The European IPO market is already treading in murky waters, and the next recession won’t be doing any favors. So, the market has become volatile, sky-high company valuations are about to come down and lucrative exit opportunities will soon become a scarcity. What can the entrepreneurs do to take shelter from the storm? Firstly, due to the reasons outlined earlier — hot air valuations, excess of VC money available — a large number of companies are not running their businesses based on metrics suitable for a bad economy. When the economy goes south, the only thing that matters should be the route to profitability. Not monthly active users, app downloads or page visits, but the actual, matter-of-fact EBITDA of the business. If this sounds self-evident to you, congratulations — you’re probably already running a good company — but a surprisingly large number of currently VC-backed businesses have built their current valuations on vanity metrics and easily accessible dry powder. Secondly, when times are bad, both consumers and businesses want painkillers instead of vitamins. Prepare for the worst times by turning your B2C pitch from wants to needs, and your B2B pitch from the CEOs to the CFOs — what’s the cost-benefit of your solution, and how quickly you’re able to turn the benefits from concept to reality (preferably the buyer should be able to see some gains within the same budgeting period the purchase is made). Thirdly, the best way to prepare for and outlive a recession is to introduce a strict culture of frugality and move the focus from the top line to the bottom. A good way to do this is to emulate corporate tactics in a recession and transfer some of the decision-making power from the CEO to the CFO — all of the company’s effort should be steered towards building a business model that is self-sustainable and able to scale independent of investors’ capital injections. It’s a cliché, but we’re going to say it anyway: in every crisis lies an opportunity. Recession acts as a filter for an overheated market to sort the actual winners from the ones that only wish to win. The companies that survive the upcoming downturn, will live happily (perhaps ever after) either in the public markets when the IPO numbers pick up again, or with their new investors who will pay anything to get on boat with solid and proven businesses. The final, and possibly the most urgent thought we want to leave you with is this: raise your next funding round now, asap, pronto, regardless of the stage your company’s in, before the winter comes. We are the go-to VC for early-stage entrepreneurs committed to building the next big thing.